Home assignment . . . Some call this book the "bible on third culture kids"
Psychologist John Larsen worked for 29 years at the Midwest Christian Counseling Center in Kansas City, Missouri. He currently is in private practice. Diane Larsen is Public Relations and Media Coordinator at the Marillac Center. For the greater part of my life I (John) have lived with an inner sense of being different. On the outside I might look like an ordinary guy. Internally, I have felt "out of sync" with my peers. Since I had no explanation for this feeling, I attributed it to some sort of personal flaw. 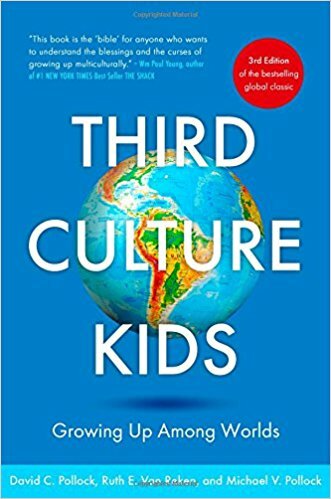 When I was in my mid-40s, my wife Diane's research introduced me to the concept of the "Third Culture Kid" (TCK). At that point, pieces of a lifelong puzzle finally fell into place. "Third culture experience" put a name to what I had lived but did not understand -- as the son of missionaries. As I read descriptions of this phenomenon, I resonated from the very core of my being. TCKs experiences bring into play psycho-dynamic factors not present in their monocultural counterparts. Accordingly, TCKs deserve special consideration in the counseling context. Our ethical mandate to practice within an area of competence requires counselors who work with Third Culture Kids to familiarize themselves with issues peculiar to these clients. First of all, Third Culture Kid does not refer to a person from a Third World country. A third culture is formed when persons of dissimilar cultures interact in a conscious attempt to create new ways of relating to and understanding one another. Typical "third culture builders" are missionaries, military and foreign service personnel, or business families who spend significant blocks of time as "expats" working abroad. TCKs are the children of these adult third culture builders. Adults who enter a new culture and are intentional about third culture building usually maintain a solid identification with their own, indigenous culture. As their children grow up, they naturally -- and even unconsciously -- synthesize elements of the parent and host cultures into a third. Hence the term TCK. These children can relate to both parental and host cultures. However, they do not identify fully with either one of them. They do identify most with other TCKs who share their history of bridging different cultures. TCKs understand the meaning of the expression, "It takes one to know one." What is different about TCKs? Enculturation is the process by which we learn to function according to the norms of a given culture. That culture determines and defines values, basic social skills, verbal and nonverbal communication styles, perceptions of reality, and worldviews. Culture shapes who we are and how we understand, interpret, and relate to our environment. Accordingly, the TCKs manner of thinking, perceiving, feeling, and relating to others is significantly influenced by his or her particular multi-cultural history. In contrast to monocultural individuals, TCKs bring to encounters within one culture the programming of another. For example, even today I must work at maintaining eye contact when I am speaking to an American. Why? Because in the host culture in which I was raised, looking at a person while speaking to him or her is considered disrespect. The behavioral norm of looking away when addressing someone was encoded into me at an early age. Despite my efforts to overcome this pattern of behavior, it has persisted into my adult life. TCKs vary in their ability to synergistically blend cultures in ways that enable them to function as integrated, grounded persons. One key variable is the degree to which parental and host cultures are disparate. For example, TCKs raised in Western Europe seem to do better at integrating cultures than do missionary kids (MKs) whose parents were assigned to tribal cultures which have experienced little or no Western influence. Most cross-cultural adaptation theories share common elements, including an understanding of stages of adjustment as progressive. Initially there is excitement about the new environment. But the "high" is not long lasting; it gives way to a second stage in which disillusionment sets in as one becomes acutely aware of differences. At this point, feelings of depression, grief, and withdrawal are common. Stage three is often marked by hostility and a wholesale rejection of the new or host culture. The TCK longs to return "home" and may relate only to expatriates or other TCKs. The fourth stage appears gradually and is marked by increased skill in using and understanding the cues of the new culture. Significant relationships with persons from this culture begin forming. The final stage is marked by independence and cultural relativism. At this point, the TCKs are able to see and accept that they and others are influenced, and in some respects bound, by their cultural upbringing. Some TCKs struggle with adjustment issues throughout their lives. They may become fixated and thus unable to move beyond a given stage of adaptation. Few have been introduced to adjustment paradigms which can assist them in mapping out a direction or processes by which to attain higher levels of adjustment. A culturally competent counselor can be helpful in this regard. In our discussion of issues that frequently arise in counseling TCKs, we will focus on MKs, a TCK subgroup which Christian counselors are most likely to encounter in their practices. Understanding the internal processes which the MK may be unable to articulate and may not even consciously recognize will be enable the counselor more effectively facilitate adjustment and healing. Like many evangelicals, MKs tend to be wary of seeking professional help. Thus, the counselor must provide an environment of psychological safety in the office. An accepting, empathic stance can encourage these clients to lower defenses and open themselves to being vulnerable. Showing genuine interest in their cross-cultural experiences and taking a thorough history (by allowing them to tell their stories with minimal structuring) is a helpful relationship-building strategy. The Christian counselor must be especially sensitive to the emotional pain and high sense of vulnerability felt by the MK client. Failure to do so can result in the loss of a client. The counselor must be especially skilled in assessing and accepting the MK's relationship with God. Being asked "Where are you from?" can sometimes be distressing to MKs. A response requires telling one's story, not just naming a place. MKs may not be comfortable sharing their story with the person inquiring. The question also evoke a bit of pain involving confusion about belonging. MKs are not able to meet the psychological need to be rooted in a community of persons similar to themselves. The longing to belong and painful sense of not belonging are ever present. An MK friend described his sensations as "the feeling of being naked in church on Sunday morning." Downie referred to the phenomenon as "being part of and apart from. "3 These clients easily relate to metaphors like living in a "twilight zone" or functioning on the "margins" of a society in which they do not feel completely at home. MKs live with a subliminal awareness of being "out of place" that can be likened to wearing clothes that are a size too small. Closely related to the problem of not belonging is the issue of identity. "Who am I?" can be a difficult question to answer even for monocultural individuals. Answering the "who am I?" question is exponentially more complex for the MK. Those who identify strongly with parents and their calling to ministry have an easier time resolving this developmental challenge than those who do not. Identity confusion is most often seen in those who have abandoned their faith, who resent God for their mission field experience, or who are alienated from their family of origin. MKs who have rejected their past often have a difficult time embracing their multi-cultural experience, a precondition to resolving their identity issues. For those who were sent away to a boarding school or a children's home, grief may be a lasting legacy. Rare is the adult MK who does not carry within himself or herself a significant measure of grief. With few exceptions, children sent off to school are not prepared to meet the challenges of living apart from parents for long periods of time. Lacking the ego structure to face the vicissitudes of living without parental support, these children become overwhelmed and even unable to negotiate normal developmental tasks. One friend remarked, "I, the man, may be 42 years old, but the frightened, grieving boy is still within me." Some missionary sending organizations have taken notice of this problem and now provide professional assistance to parents and children facing separation. However, most adult MKs were left as children to deal with grief and loss alone -- as were their families. A biblically buttressed understanding that separation was necessary to advance the Lord's work was once thought sufficient to fortify children and parents alike. In most instances, pain was handled by stoic withholding to protect each other from further suffering. Internalized, "frozen" pain related to parental separation is a primary focus of therapeutic work with many MKs. At boarding school or in the children's home, crying when one's parents departed was viewed as weakness. Processing pain with one's peers was unheard of. In the absence of institutional support to normalize and facilitate grieving, many MKs report having developed private rituals to mitigate the pain of parental loss. Unresolved grief and anger related to abandonment remain areas of vulnerability for countless adult MKs today. Not surprisingly, many follow in their parent's footsteps by choosing missionary service or some other form of Christian ministry. A second group becomes alienated from God and parents. Those in this group, which constitutes a large segment, live their lives full of bitterness over the MK experience. The third segment consists of "faith ambivalent" MKs who live somewhere between these extremes. When working with clients from the latter two groups, the counselor must give the MK permission to feel his or her pain while seeking to understand its basis. Even seasoned clinicians can fall into the trap of trying to talk a client out of a feeling. When this occurs, the client will not feel understood and will likely retreat from the counseling process. Pain has a purpose. The counselor must facilitate its processing to bring about healing. Otherwise, pain is wasted. MKs with psychological insight will acknowledge that feelings of abandonment related to early life separation from parents complicates their relationship with God. If not already present, the perception that parents care more about their work than they do about their children emerges in the consciousness of the MK at the time he or she is sent away to school. Many who were not sent away report the same feeling. The resultant negative projections placed on God can be difficult to overcome. A sensitive Christian counselor can facilitate healing in these clients' relationships with God. But we must tread lightly, seeking to mediate God's grace and acceptance through heavy doses of affirmation and non-judgment. We must be conscious of possible of negative transference dynamics arising from our being in a Christian occupation like the parents. MK clients are highly sensitive to abandonment cues. So, it is important that they be reassured that they will be nurtured through the healing process however long it takes and whatever it requires. Healing will come gradually as the well-grounded, non-anxious clinician "incarnates" God's love through the therapeutic relationship. The culturally competent counselor recognizes the vulnerabilities of clients in a particular cultural group but also affirms their strengths, seeking always to maximize these. Being mindful that while MK clients look and act like their peers they may process information and experience life differently is essential to therapeutic effectiveness. TCKs can be talented, resourceful persons who relate with great facility across cultural boundaries. Adaptability is a strength seen in many who have sustained multiple moves in childhood. Such people often display an adventuresome spirit and enjoy a highly developed sense of humor. Strong defense systems developed in the course of surviving multi-cultural encounters serve them well in meeting threatening situations. Despite vulnerabilities noted earlier, they are survivors who can be tough minded. Multilingual fluency, a high degree of global-mindedness, and broad perspectives seen in most TCKs equip them for careers in the growing global economy. Sadly, many Third Culture Kids underestimate and devalue their most marketable skills. TCKs have had extraordinary life experiences which can work for or against them. Many need help to identify and process the pain that accompanied the formulating experiences in which they learned to bridge cultures. Christian counselors can play a significant role by helping them to name and to value their diverse experiences and special abilities. Healing comes to TCK clients as they learn to embrace themselves in the eyes of an accepting, understanding counselor, through whom they experience the unwavering grace of a loving God. 1T.P. Gleason, "The overseas experienced American adolescent and patterns of world-mindedness," Adolescence 8(32), 1973: 481-490. 2S.D. Larsen, Communication challenges of missionary children returning to the United States: The relationship to cross-cultural communication variables (Masters thesis, University of Kansas, 1991). 3R.D. Downie, Re-entry experiences and identity formation of third culture experienced dependent American youth: An exploratory study (Doctoral dissertation, Michigan State University, 1976): 349-A. This article originally appeared in the summer 1998 issue of Christian Counseling Today , a journal published by Christian Counseling Resources for the American Association of Christian Counselors. Edited and used by permission. Looking for more MK resources?